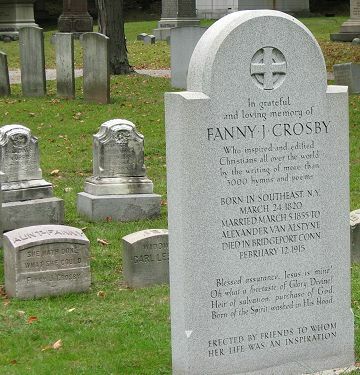 Mountain Grove Cemetery, Bridgeport, Connecticut, U.S.A.
Frances Jane "Fanny" Crosby (1820-1915) was an American hymn writer and poetess, who wrote over 8,000 hymns during her life. One time a preacher sympathetically remarked, "I think it is a great pity that the Master did not give you sight when He showered so many other gifts upon you." She replied quickly, "Do you know that if at birth I had been able to make one petition, it would have been that I should be born blind?" "Why?" asked the surprised clergyman. 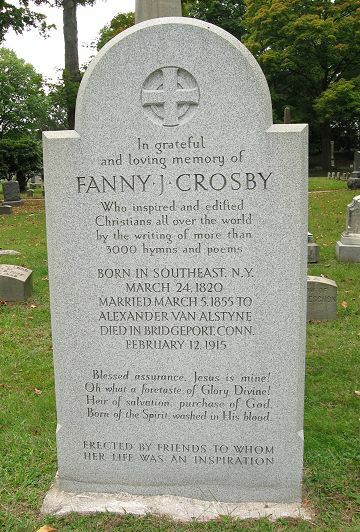 "Because when I get to heaven, the first face that shall ever gladden my sight will be that of my Savior!" The monument above is located behind the larger one below. 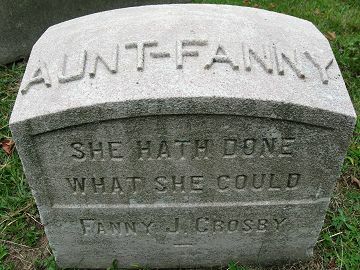 Call ahead for Cemetery and Office hours. Main entrance at North Avenue and Dewey Street.